Take a moment just now and think. “Is my walk with Jesus kind of up and down?” Do you find yourself happy in Christ and serving the Lord one week, and depressed, despairing, and not caring about your spiritual walk the next? We can talk about our inner desires all day long, and mistakes vs. sin and things like that, but I came across something bro Branham said that really stood out to me. The Bible said, “Love not the world, and neither the things of the world.” And if you love the world, the love of God’s not even in you…?… You’re only emotionally, mentally worked up for some kind of a churchanity, some kind of a theology that’s been taught you, and never in your life have you ever come face to face, and met Jesus Christ, and been born again. For if you once fall in love with Christ, the world dies right then for eternity. Are you really in love with Jesus?? Because if there’s things of the world that you just can’t give up despite your love for Jesus, then “never in your life have you ever come face to face and met Jesus Christ”. Please, my dear friends… let’s look at our lives. Are we up and down?? If you feel I’m scolding or harsh, please forgive me. I ask you to realize the day we are living in, and the spirit of the day. The Laodicean church age fights the spirit of “I sit a queen and have need of nothing”. It’s the age where Jesus is on the outside trying to get in. It’s the age of being blind and naked and not knowing it. This is a decietful age if there ever was one. You better believe we should be looking at our lives to make sure they line up with God’s Word. We better look at our relationship with Jesus to see if we are up and down, or if we are just flat out, unabashedly, unashamedly in love with Jesus Christ. This evening I was honored to baptize my brother-in-law in the name of the Lord Jesus Christ. He’s been running from the Lord for awhile now, but God in His grace brought him back. 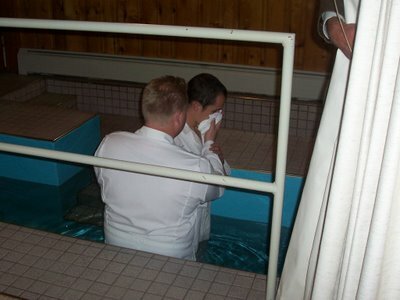 This was the first time I’ve ever baptised anyone, and it was truly a honor and blessing. What a change my God can make in someone’s life. What a reality He is! Praise His name! God Bless you Amos. May He cause His face to continually shine upon you the rest of your days. Rest in you Lord and savior, Jesus Christ.